Redhills Adventure in Kildare has establishing itself in the adventure/activity space in Ireland. 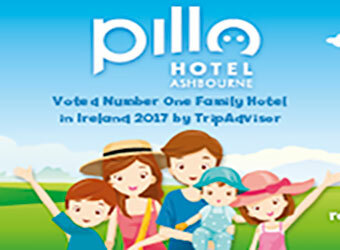 Their activities are fast becoming a ‘must do’ with people travelling all over Ireland to enjoy the experience with them. 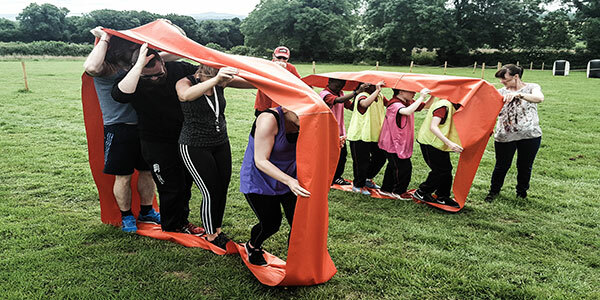 The experience differs depending on the age of the individual or type of activity, for example a team building challenge where a mental skillset is required versus a tag activity where physical exertion is required. 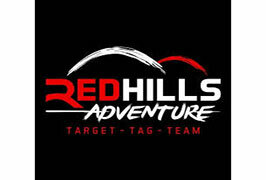 Redhills Adventure’s goal is that their customers leave feeling satisfied they have had a fun, adventurous, adrenaline fueled day that suited their ability, skillset or desired level of participation. At Redhills they have developed a reputation for quality gaming so they cater for the experienced gamer to the first timer whether you are on a school tour, family group or getting into the sport as a hobby. Their game types, props and player initiatives are replicated by venues all over Ireland. Are you looking for the next level in birthday party activities? At Redhills Adventure they cater for ages 8 years and up with a different to the norm, safe and action-packed activity offering. 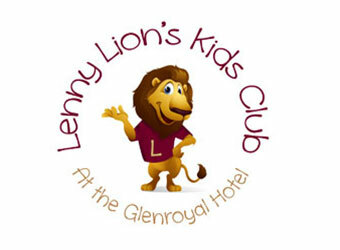 Pizza and a drink are included for groups over 10 children or for smaller groups can be added. They offer birthday packages seven days a week. Multi activity packages are also available depending on budget. Family Fun Tip :- Want to bring a Birthday cake and set up your area with party memorabilia, feel free. Why not mix it up and try something a little different for this year’s school tour. Redhills Adventure are looking to develop a partnership with your schools and to work with you on tailoring the day to best suit your budget, your needs as an organiser and ensure all concerned leave raving about their day. They also recognise that the teachers need some attention as well, so they supply the travelling teachers with free lunch, tea and coffee. Redhills large registration area can cater for large groups for activities, picnic time and an area will be kept for teachers to relax. We very much look forward to hearing from you and welcoming your group to Redhills should you choose us as your new School Tour Venue. Redhills Adventure activities are unique and as well as their tag activity offering (Airsoft, Splatmaster and Archery Tag), they offer large groups some really great Team Building activities such as the Run Mat Challenge, Community Games, Assault Course and more to suit every budge. All Redhills Adventure activities are safe, fun and action packed and as they are team based we cater perfectly for large groups as well. Archery Tag Archery Tag is phenomenal fun and Redhills Adventure is one of Ireland’s only official providers. The aim of the game is to eliminate your opponents either by striking them with a special foam tipped arrow or knocking out their five spot targets. 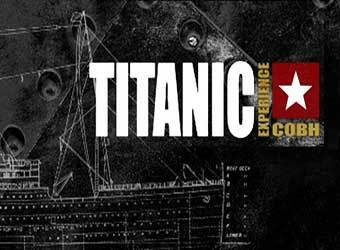 Ideal for children or adults. Archery Tag is fun, very safe and simple to get the hang of. It’s suitable for all ages from your 8 years old to the CEO of your company as we have bows for all ages. Perfect for Birthday parties, Family Events and more. Family Fun Tip :- They operate Archery Tag on the road also so we can come to your town hall, school or college gym, hotel ballroom, open park or home! 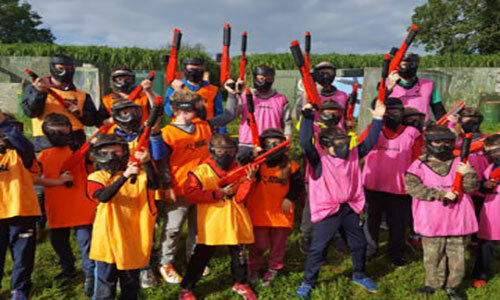 Redhills Adventure Kildare venue is ideal for the younger adrenalin junkies looking for an awesome paintball experience with less of a sting! You’ll be using smaller and lighter Splatmaster guns which shoot paintballs at a lower impact than regular guns, allowing youngsters to enjoy the thrill of paintball in a totally safe environment. Even more important are the thrilling battlefields. With no other venues in the region dedicating themselves to the pure excitement of junior paintball, it is games like Capture the Flag and Territories that will keep you coming back for more. Family Fun Tip:- Ammo is 100% biodegradable, non-toxic, resists stains, and easily washes away with water. Airsoft is a tag activity similar to paintball but where lower impact and more realistic equipment is used. Battle it out in a series of realistic mission scenarios where ecah mission requires strategy and teamwork as you take cover across a variety of different terrains. Like paintball, airsoft is a team combat simulation but has none of the mess and you’ll even get your hands on replicas of the most recognisable weapons used in real combat situations (as well as your favourite action movies!). Whether it’s arming at a fuel tank or hunting the high value target you’ll feel like you’ve been transported into a video game as you meander through realistic game zones from real buildings to 16 foot high grass, secret huts and trenches over 5 acres. At Redhill they recognize it isn’t always just about the fun side of things and your needs as a team, school tour or sports club for example might extend to testing your participants on how they work as a team, complete objectives either mental or physical and hone their leadership skills. Children and Adult Challeneges adership skills. At Redhills Adventure they have introduced a range of team challenges that are suitable for younger participants or adults. Family Fun Tip:- The type and number of challenges included varies depending on your needs, available time frame and the level of difficulty so just let them know your needs and they will tailor the session accordingly. Brave the cargo net, endure the monkey bars, balance the beams, navigate the minefield and meander the laser beams and more in the assault / obstacle course suitable for ages 7-18. Enjoy completing the course and bettering your time or compete relay style to the finish line. Archery has soared in popularity in recent years owing to the likes of the Hunger Games trilogy or hit TV shows Game of Thrones. Test your strength and accuracy on the new range whether you are looking to take up the sport or just have some fun on a day. Archery is a great all-rounder activity which works well for individuals, parties, team-building and family events. You will be a sharp shooter in no time at all! Family Fun Tip :- Redhill supply all the professional equipment necessary including arrows, bows and arm protection as well as guidance and supervision to ensure your safety and enjoyment throughout the event. Using the coolest and most realistic looking equipment available, hone your aim and test your reflexes in this interactive Airsoft Target range! Play different game modes and compete for the best time or have a bit of fun plinking away with the range of Airsoft guns. Family Fun Tip :- If you get bitten by the bug you will be pulling on the uniform in no time and joining in any weekend for the very popular Airsoft open skirmishes. 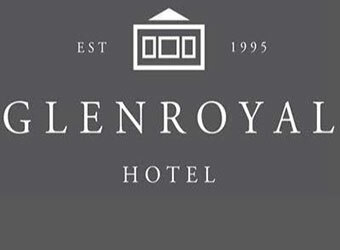 Redhills Adventure is located just off the M7, 35 minutes drive from the Red Cow interchange, and under an hour from Dublin City Centre, Carlow, Kilkenny and Athlone. 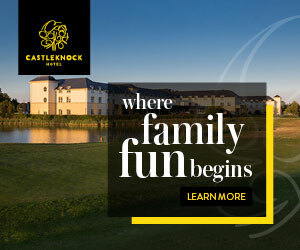 They are only an hour twenty minutes from Waterford and Limerick cities.